They have some gorgeous kits and very reasonable prices. Should check them out! So after I typed my last post - Get Real, I had a sudden urge to scrap SO I give you my first LO since November last year!!! It's pretty simple but I love it and the photos are just so cute. This is Joel and his little girlfriend Tilly from Playgroup. Well I've been umming and ahhing about whether to do this or not, but have taken the leap. 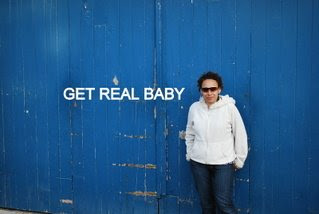 My friend on SOF, Lusi, has put out the challenge on her blog to Get Real Baby. To say what's really happening in our lives at the moment, instead of hiding behind the perfect housewife and mother mask. Cause let's face it, that ain't me! So I'm whipping off the band-aid... here it goes. I am way behind in my washing. I have at least 3-4 loads to be done. I have just about run out of undies!! I spend way to much time on the computer and really need to not. It's not healthy! I wish we had the money to buy a bigger house but know I should feel blessed to just have this one right now. I've cried so much this week over the bushfire situation. I cried today at the local shops when I saw people donating goods. I'm such an emotional person. I haven't scrapped a LO since the SOF Retreat in November last year. I am one of 2 girls in my playgroup who has yet to have (or be having) their second child and I'm feeling a little jealous and a little pressure but know it's not time just yet. I need to spend more time with God. So there you have it. Me in all my reality at the moment. 4. That my mum and dad are coming home to visit in about 123 days! 5. That I had the opportunity to donate money to the Bushfire Appeal today. Hopefully I'll be back soon to share some more.